Are Evangelism Surveys a good tool for spiritual Conversation? 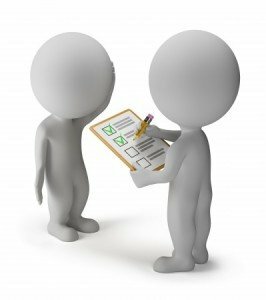 Are Evangelism Surveys a Valid Tool? I don’t like Evangelism Surveys. Today I was reading over at Ministry Marketing Coach blog and found an article on Evangelism Surveys (link broken and removed). What is an Evangelism Survey? Some of you have likely used these Evangelism Surveys. These are the evangelism surveys that aren’t really surveys, but simply innocent questions to force open the door to a spiritual conversation. They often collect irrelevant data, but lead up to questions about the gospel and a person’s spiritual need. See the zinger that gets dropped like a hand grenade in the middle of innocent conversation? I dutifully jotted answers as if I was collecting real data. I was the obedient survey taker and shared the gospel at the end of the evangelism survey if they said yes. I felt like I was witnessing, but feeling awful that the I had no purpose for the evangelism survey other than to force open a conversational door. For a seminary class assignment, I had to have a gospel conversation with someone at least once a week. It’s true that I was doing a class project (for Evangelism 101), but the survey was bogus. I had no purpose for the data, tossed the form when it was over, and walked away feeling like I had completed the assignment. Mission accomplished. Got the grade. However I felt like I had told a white lie. I wasn’t collecting data, the evangelism survey was simply a ploy to break the ice. I was witnessing to the TRUTH of the gospel through a FALSE pretense. I don’t use evangelism surveys anymore, because there is no honesty to them in doing evangelism. Do you use Evangelism Surveys? If you have an honest evangelism survey, I’d like to see it. If you think evangelism surveys are an acceptable pretense for a conversation, I encourage your comments here. I’d much rather simply say (and I do) “My name is Sam Shaw and I’m with ……….. church. I’m out talking to anyone who is interested about Jesus Christ…. I find the direct, honest, straightforward approach is honored by God, and actually is responded to by people in a positive way. Nice, simple, and clean. Thanks for the comment. I’d never thought of surveys in that light before. I like Evangelism Explosion’s approach. After beginning to get to know a person, using the 2 diagnostic questions. BTW, I’m going to send your blog’s URL to some of our Christian Ministries profs and students. Hope your comments will get them thinking. Thank you for your honest thoughts. I do share some of your feelings about the questions you blogged. Surveys can certainly be just that, a survey. I personally feel, however, they can in fact open the person to thoughts and feelings in a friendly forum. I personally thing surveys are good for learning and starting out in evangelism, because a person may not necessarily have a mature faith with all the answers, but can still feel comfortable asking some basic questions. What do you believe happens to people after they die? Do you have a Bible at home? Asking for opinions and doing a survey imply two different things. Doing a survey is gathering data for analysis of the community. Asking for opinions is to talk about ideas and beliefs. My big concern with such evangelism surveys like I practiced is that one is not really collecting data. I used the form as if I was collecting data, and then threw it away. There was no analysis of the data that was being “gathered” and there was no purpose in the data. Sure, we talked about opinions, but the survey was a false pretense to discuss opinions. Surveys are to gather data. They can be used in community exegesis where you are learning the needs of the community and its spiritual condition. I think that some of the organizations that are doing surveys are actually compiling real databases of data to be able to say that “x percent of our neighbors think. . . .” and “y percent of our neighbors have a bible. . .” To me, that would be a correct outcome of a survey. To tell people you are doing a survey implies the gathering of data for such analysis and understanding. If one just wants a conversation, surveys are false pretenses. I realize this is an old article, but I’m going to comment/ask a question anyway. I have used surveys as a tool for evangelism before and was thoroughly confused when the ministry who gave me the tool told me that they weren’t collecting the survey after we went out and got answers from the public. I felt exactly how you describe above, that I was in some way being dishonest. At the same time I felt the survey really did lead to great discussion and the answers they gave in the survey could truley be used as data to be analyzed. If I were to personally keep the data from the survey and interpret them in the conglomerate to better understand and sympathize with the views of the general public in order to better reach them and have deeper discussion, do you believe this to still be dishonest? If you were actually using the data for information about your community, then you truly are doing a survey. Whether or not it’s statistically valid is another question for another day. If you were gathering data for your purposes that allowed you to say that “x percent of our neighbors think. . . .” and “y percent of our neighbors have a bible. . .” or have some kind of real results in community exegesis then I think a survey is not a false pretense. If you are simply using a survey for no other reason than to launch a conversation, I think it’s a false pretense. I came across this website out of the desire for both. I want the data and I want the conversation. But also, I think if you make the data available for the people who took the survey, you have a second opportunity. I really want to know if people know the meaning of Easter for example. And I want people to think and talk about it. If you made the data available on a website, via link on an email. Make it an option and do the work of data analysis. That would give the person the opportunity to see how his thoughts stack up in the poll. Plus you could post on the website whatever other info you wanted to afford them. I think the survey taker also has to have a sensitivity to people. It’s possible that it’s not time for that conversation yet in their lives. But you’re still interested in their thoughts. If you’re not, than you’re confused as to the whole purpose. And you can impede spiritual development by forcing person to walk down a road with you that they don’t want to travel. They will go exactly the opposite way. Well said. Feel free to return here and share the results of what you learn. If you post your results on-line, feel free to link to them here as well as an example of how to do such an evangelistic survey. I feel that there shouldn’t be any tricks to evangelism. The Gospel is powerful, and the Holy Word of God is convicting. The Holy Spirit is infinitely powerful too. When I share the Gospel I’ll say something like ‘Chris, God loved the world so much that he gave his only Son Jesus for you – so that if you believe in Him you wont perish but have eternal life” [this is john 3:16 NLT with Jesus added in there and some changed up punctuation]. Sometimes I don’t even know the person’s name when I share the gospel with them. But often I think I feel God’s Holy Spirit prompting me to share the gospel; but often i procrastinate the conversation and try to become more “personal” by beating way around the bush saying things like “Man the weather sure is nice” or “what are your plans for the weekend?”. Often the conversation is ended because one of us had to do something else and I never shared the gospel to the person. We should share/preach the gospel boldy and with confidence. Thus I try to share the gospel as a fact. I used to say “Hey man, I know everybody’s got their own personal and religious beliefs and you might ahve yours too, but i want to let you know that God so loved the world that he…. [continue john 3: 16 or someother gospel statement]. I dont know or think there is one best tactic to conversational evangelism. The best thing is that you have a heart to be brave, follow god, and do whatever it takes for that person to be saved (prayer, speaking even if it seems awkward for both of you, service, skipping a meal or nights sleep etc…). I know the Paul says to preach the gospel boldly (as in without fear or hesitation) and gently (without accusing or condemning. The gospel is typically defined as good news – but that doesn’t mean somewhere in you’re conversation if the topic of Hell comes up, that you should avoid the condemnation part like John 3:18 (18 Whoever believes in him is not condemned, but whoever does not believe stands condemned already because they have not believed in the name of God’s one and only Son.). I ended up on this article because I was actually searching for some surveys to print up to take out on an evangelism outreach, hahaha. My initial thought was, “You’re thinking about it too much.” But, if you’re conscience convicts you about it, then you may have to follow it. Years ago I started out & learned using the “survey” approach (a small piece of paper with questions on it) and found them to be great conversation starters with people. Only once was I ever called out by someone who said, “You aren’t writing any answers down.” I never once wrote anything down, never carried a pen, never carried additional paper and never did feel like I was doing something wrong. I put the word in quotes because it sounds like you were actually recording things down, I never did (nor did anyone else in the group). The point communicated to us was to get us to start conversations, not make people think we were collecting data. But now, I don’t do the “survey” approach and, like the first commenter said, I’m usually just direct I cut through all the other questions and usually say, “Hi, could I ask you a thought provoking question? What do you think happens to you when you die?” BAM! Now for those who aren’t comfortable being so direct or don’t know where to go from there, I have no problem with the “survey” approach :). It helps get them out of their comfort zone, helps encourage them to see that more people than they think are willing to talk to strangers and about spiritual things. I loved the idea of making the data available, especially if presented personally. “Would you like me to report to you the findings of our survey?” That would be a very appropriate opportunity to share its purpose and our concern for their situation in relation to Christ. Personal interest and concern is Christlike. I think there is a big difference between using questions as conversation starters and saying that the questions are a survey. We have to talk about our faith with integrity. But to ask someone for help in a survey as a pretext to your other questions if there is no purpose is a deceitful opening question. I think, Bruce, you and I are on the same page there. We use them all the time. We call them questionnaires and honestly want to know what people believe and why they believe it. The information is for us and our understanding. When it is done (10 questions) we thank them, identify ourselves as Christians, and ask permission to share what we believe and why. it is a VERY egfective tool.